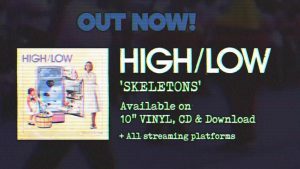 HIGH/LOW – Skeletons OUT NOW! HIGH/LOW – Do you like SKELETONS? Taken for the album ‘Stuck In A Void’ Get the whole album here – http://wearehighlow.bandcamp.com/album/stuck-in-a-void-album. High/Low – ‘Stuck In A Void’ Album Trailer. To order our debut album ‘Stuck In A Void’ Please go to www.wearehighlow.co.uk.